Many of our native species are dependant and semi dependant on tree hollows as shelter from the weather and as protection from predators. They also use tree hollows as breeding and socializing sites. 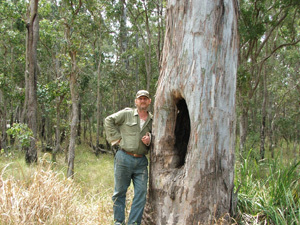 Research tells us that many species will use several tree hollows. 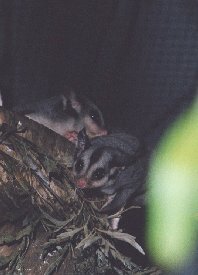 For example, it was found that Sugar and Squirrel Gliders use up to 6 different hollows over a 12 month period. What is the importance of Tree Hollows to Wildlife? 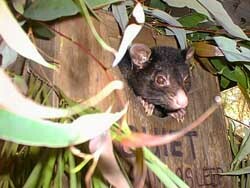 Tree hollows are a valuable & essential resource for many wildlife species. Removal of hollow bearing trees from an area may lead to the displacement and death of those species dependant on these hollows. In turn this leads to localised extinction of these species and loss of biodiversity. This leads to loss of insect eating species and pollinators, which are a great friend to agriculture. 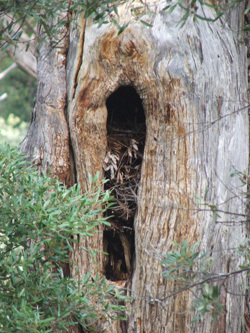 What type of tree hollows do wildlife need? Animals & birds do not select tree hollows at random. Factors such as entrance size & shape, depth, degree of insulation, etc generally dictate which species uses which hollows & their frequency of use during summer & winter. 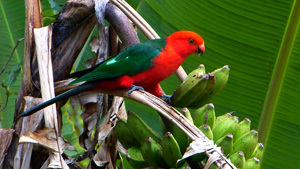 A range of hollow types is necessary to maintain a diversity of wildlife and thus improve overall biodiversity. Research has again shown that many species also prefer tree hollows in large dead trees. This highlights the importance of retaining dead trees as well. Hollows in fallen trees are equally important for on ground dependant species such as the Echidna, Quoll, Bandicoot and many lizards & reptiles. How do tree hollows form? As trees age they are subject to various natural forces which contribute to the formation of hollows. These include wind, storms, rain lightning and fire. Fungal & bacterial activity can set in and can be assisted by insect attack from termites, beetles & borers. Wildlife can then renovate these areas using their beaks, claws & teeth, to help enlarge the hollows. Hollow formation is also dependant on a tree's history and its location. 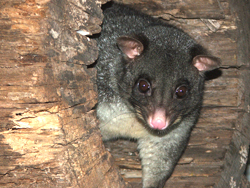 As a general rule it takes approximately 100 years to form small hollows that are suitable for such species as the Feathertail Glider, Phascogale's, Sugar Gliders, Squirrel Gliders, Kingfishers & some of the smaller Parrots. 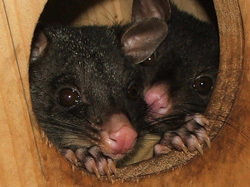 Medium size hollows can take up to 200 years to form and they are suitable for the larger Gliders, Possums, Kookaburras, Kestrels, Falcons & Cockatoos. It takes almost 300 years to form the larger hollows that are required by many of our Owls, Raptors & Black Cockatoos etc. If these larger hollow bearing trees are removed it takes nature a very long time to replace them. Gum trees are our regions main hollow forming trees. As a general rule 3-10 hollow bearing tree species may produce up to 30 different size hollows. When these are reduced or removed the more dominant animals and birds will take over the remaining hollows. This forces smaller species to utilize less satisfactory shelter and consequently suffer increased weather exposure and predation. Therefore it is essential to consider tree hollows as an important part of our ecosystem. Retain Fallen trees on the ground, and in creeks Plant tree species which produce hollows Build & install several different type nest boxes. Details on how to construct all the different types of nest boxes can be found here.. 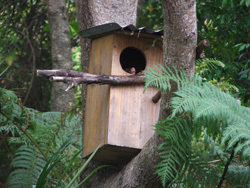 It is important that these nest boxes are sited correctly to suit the species, according to winter and summer aspects. They must also be located at 3m or greater above the ground.